There are certain days in history that remain etched in our minds forever- events that we can recall with vivid detail years after they occur. For me, Monday April 15, 2013 will always be one of those days. I will never forget walking out of the gym locker room to see a small crowd gathered around the TV. My heart sunk as I read the headline: “Two bombs explode at Boston Marathon.” After quickly accounting for all of my friends who were in Boston racing and supporting, the gravity of the situation fully hit me. As both a runner and a devoted marathon spectator, I immediately connected with the victims of this tragedy. I know what it feels like to be a supporter at a World Marathon–to be part of an entire city coming together to cheer on thousands of people as they realize a dream. Marathon Day is supposed to be the happiest day of the year (especially in Boston) and I was shocked and appalled that somebody would try and take away from what is for so many people, the proudest day of their lives. As I began to learn of all of the amputations being performed as a result of the blasts, it started to become even more personal. I longingly wished that I could meet some of these people and tell them that they could still run marathons and do triathlons and live big beautiful lives. I wanted to be there for them, just like the rest of this country. But I knew the chance of me encountering one of these individuals in the near future was highly unlikely. But as I’ve said many times before, life has a funny way of working out. 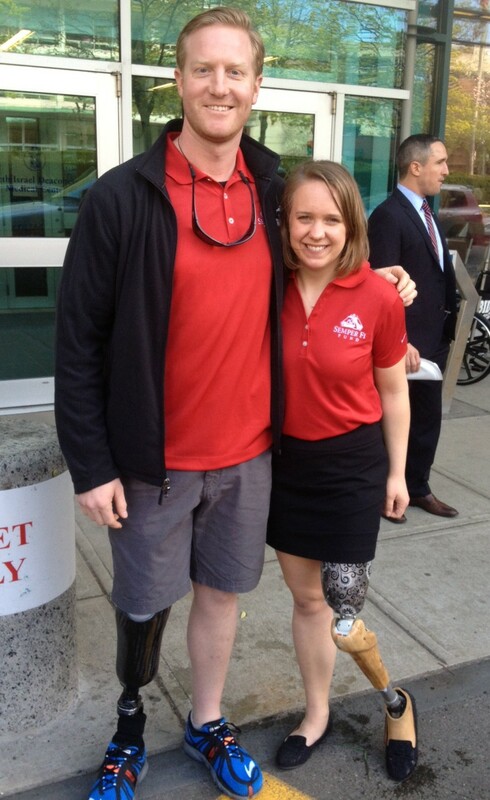 On Wednesday morning, a week and two days after the bombings, I got a phone call from my friend Melissa, a fellow amputee who was injured in Iraq. She had been asked to come to Boston with the Semper Fi Fund, a group that works with injured Marines, to meet with some of the victims of the bombings. Melissa was busy hanging with the five living US Presidents (seriously, I’m not kidding- she’s kind of a big deal), but the group was really looking for a female to attend to offer a woman’s perspective. She suggested my name, and 24 hours later, I was on a plane headed to Boston. When I landed, I found a group of eight guys—mostly Marines, most amputees—who quickly took me in as one of their own. Some of the guys had visited the Boston hospitals the previous weekend, and the patients loved them so much that they asked them to come back for round two. The group was thrilled to now have a woman on board, and the hospitals were excited to introduce me to their female patients. We spent all of Friday visiting two hospitals and an inpatient rehabilitation hospital where many of the survivors were being transferred. I was able to meet with six incredible women, most of whom sustained amputations in the bombings. These women were of different ages and different life experiences, but each of them moved me in a special way. Some of them recalled their memories of Marathon Monday, and expressed how lucky they felt to have made it out alive. We talked about their futures–the good, the bad, and the ugly. We addressed their fears and concerns, but we mostly shared all of the ways that losing our limbs have made our lives better. We talked about how I can get different designs on my prosthetic, and how I paint the toenails on my fake foot to match my real one. We told them about how the entire nation was captivated by their stories, and how they would go on to inspire the world by choosing to live life fully. I went into these visits worried about saying the right things, thinking that my words were my most powerful tool. But I quickly realized that just being there was enough. One of the most poignant moments was during a my first visit of the day. I was walking into the room of a young woman who had lost one of her legs in the blast when I ran into her mother in the hallway. As soon as this mother saw me, her face lit up and tears started to form in her eyes. She told me I was beautiful and pulled me into a hug, and in that moment, I could feel a sense of comfort rush over her. Until then, her only conception of life as an amputee was her daughter in a hospital bed. Though she had met some of the Marines the previous weekend, she had yet to meet a woman who was in the same situation as her daughter. But right there, in the middle of the hallway, she realized that her daughter was not going to have to sacrifice her confidence, her fitness, or her femininity. She could be a beautiful, thriving woman who is comfortable in her own body. All of that, communicated in a hug. It was amazing feeling that I will never forget. I think that a lot of the impact of these visits won’t be felt until much later on. You can only get so deep in a 45-minute visit 10 days after your amputation. But I hope that I can continue to be there for these women even after they settle into their new lives at home. I hope that they call me when they buy their first pair of heels, or when they want to know how to talk about their injury with that new guy that they’re dating, or when they are wondering how to respond to questions from kids on the street. And even if they don’t call me when these things come up, I hope that they will at least think of me and remember that even with the loss of a limb, their lives can be amazing. While the visits with the patients were extremely moving, I had another potent experience in Boston that I could not have predicted. On Friday morning, I woke up early to get a run in before the long day of hospital visits. Most of the runs that I do these days have a very specific training purpose, but I decided that this run was going to be just for me. No watch, no recording of splits, no preplanned route— just me and my thoughts in a beautiful new city. But it didn’t take long for me to realize that this run was about much more than just me. It might sound crazy, but a lot of times I forget that I have one leg; and because I’m around it all the time, I forget that seeing an amputee on a running blade is something that most people find out of the ordinary. But on this particular day, I was especially cognizant of the thing that makes me different. While I don’t want to overstate anything, I can’t help but think that my presence made an impact on the people that I encountered in those 60 minutes. But I’m telling you, I could feel it. I felt it in the smiles from my fellow runners, the head nods from the pedestrians on their way to work, and the fist bump from the guy selling newspapers on a street corner. I want to think that for this city, on this day, this was exactly what they needed. I want to think that for these people, seeing a girl with a fake leg run through the city was sign that everything was going to be okay. Hope is a powerful thing. It is found in places you would never expect during times when believing in good feels impossible. Whether we realize it or not, each of us serves as a source of hope for others every single day. If we’re lucky, we are able to see the impact immediately, though sometimes it isn’t brought to our awareness until many years later. Hope can derive from the words we say, but more often it comes from the things that go unspoken. Hope is a friendly smile, a reassuring touch, a warm embrace, a morning run, and a prosthetic foot with toenail polish. We were able to give a little hope to a group of people when they needed it most, but what the people of Boston may not realize is that they gave us the same thing in return. They restored my hope in human nature by reminding me that even in the face of evil, there is so much good in the world. They gave me hope in the future of their city with their resiliency, unity, pride, and outpouring of love. I will forever remember those 48 hours in Boston as one of the most humbling experiences of my life. I have to extend a huge thank you to the Semper Fi Fund for allowing me to join in this incredible opportunity and for treating me as a member of your family. Thanks to the survivors and loved ones for letting me into your lives and allowing me to experience your emotions with you. And thanks to the city of Boston for being so wicked awesome. I can’t wait to come back and run through your streets once again, this time in the company of some inspiring heroes with running blades of their own. absolutely incredible once again, miss hailey! you are so inspiring. keep it up love! WOW. Thank you. That’s all I can say. You are truly an inspiration and you never cease to amaze me and everyone around you! This is a beautiful post!! You are doing amazing things. Thank you for sharing your experience. (I met you last year at Lil’ Leg’s party…Mel’s friend from HS). You and Melissa are such great examples and leaders. Thank you. Hailey, You are amazing and you are an extremely gifted writer!! It is truly an honor to know you!! Thanks for going to Boston and for being an inspiration to all of us everyday!! What courage and beauty – both inside and out! Thanks for sharing! What a nicely written story about compassion and spreading hope. Thank you, Hailey.